Home » Company News » Feelin’ the Love!! The phrase “tree man” may conjure up ideas of rough, tough, and gruff, chainsaw wielding men that speak rudely to each other and occasionally bust out in fisticuffs. 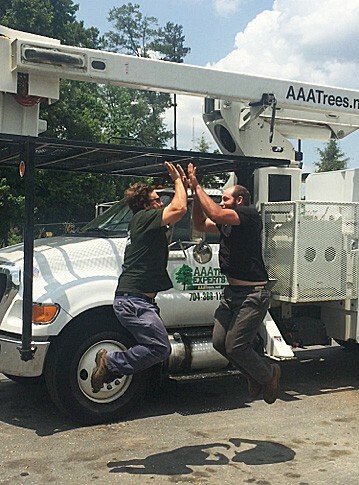 While this may be true with some folks, AAA Tree Experts strives to create a family environment in which individuals care for each other and watch out for each other. Because we work at heights and with sharp tools and dynamic forces regularly, it’s imperative that we care about each other enough to teach, learn from, and communicate with each other. And while we’re all human and occasionally do disagree, we focus heavily on the appropriate ways to communicate with each other and how we can be solution oriented. We have safety meetings and discussions at our shop weekly and job briefings and tailgate safety meetings on job sites. We are committed to fostering an environment that values caring for and looking out for one another and we feel that this greatly benefits us as well as the clients we have the privilege of working for.